Thurman (28-0, 22 KOs) ends a 22-month, injury-caused ring absence with his third straight and fourth overall appearance at Barclays Center in Brooklyn, New York, on January 26, his eighth defense being against third-time title challenger Josesito Lopez (36-7, 19 KOs) as Premiere Boxing Champions returns to FOX (8 p.m. ET/ 5 p.m. PT.). “I’m extremely excited to step back into the ring. It’s a little nerve-wracking considering the time off and because I want to have a tremendous performance. 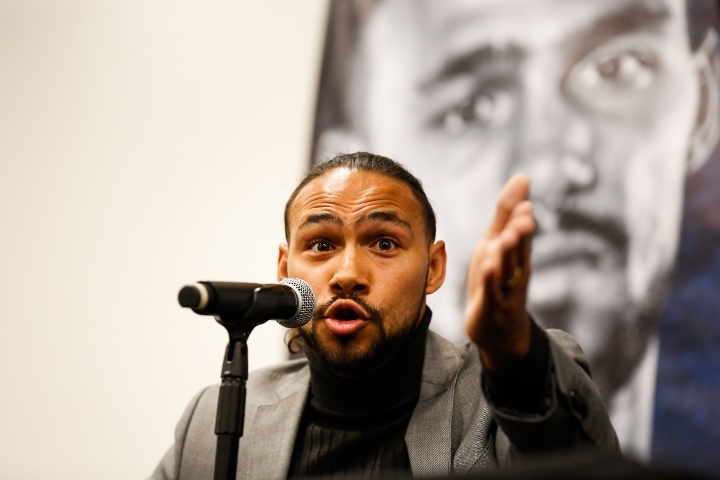 I want to speak more with my hands more than my words and quiet the naysayers who think that Keith Thurman has lost his passion and skills in boxing,” said Thurman, who turned 30 last month. “One Time” returns amid successive appearances by left-handed, eight-division and WBA “regular” champion Manny Pacquiao, WBC and IBF counterparts Shawn Porter and southpaw Errol Spence, switch-hitting three-division and WBO titlist Terence Crawford, and two-division title winner Danny Garcia. “We have the starting quarter [of the first year] set for you guys and nobody knows how it’s going to play out. But it’s like a good book and you have to take it chapter by chapter,” said Thurman. The action starts on January 19 as Pacquiao (60-7-2, 39 KOs) fights four-division champion Adrien Broner (33-3-1, 24 KOs) at the MGM Grand in Las Vegas on Showtime Pay Per View. On March 9 at the MGM Grand in Las Vegas, Porter (29-2-1, 17 KOs) makes his initial WBC title defense against 2008 Cuban Olympic bronze medal winner Yordenis Ugas (23-3, 11 KOs) on FOX return (8 p.m. ET/ 5 p.m. PT.). A week later on March 16 on Fox Pay Per View, “The Truth” Spence Jr. (24-0, 21 KOs) pursues his third defense and 12th straight knockout against four-division champion Mikey Garcia (39-0, 30 KOs) at the Dallas Cowboys’ AT&T Stadium in Arlington, Texas. On March 23 at New York’s Madison Square Garden on ESPN, switch-hitting three-division champion Terence Crawford (34-0, 25 KOs) could face either left-handed former champion Luis Collazo (38-7, 20 KOs) or ex-titleholder Amir Khan (33-4, 20 KOs), the latter of whom scored three knockdowns in May 2014 during a unanimous decision over Collazo. Finally, on April 20 at a site to be determined, Danny Garcia (34-2, 20 KOs) looks to rebound from September’s unanimous decision loss to Porter against brawler Adrian Granados (20-6-2, 14 KOs, 1 NC) on FOX (8 p.m. ET/ 5 p.m. PT.). Thurman is 7-0 with four knockouts in title fights entering his clash with the 34-year-old Lopez, whose unanimous decision in April over previously unbeaten Miguel Cruz was his third straight victory under trainer Robert Garcia. Thurman’s past two fights were a unanimous- and split-decision over two-time champion Porter (June 2016) and two-division title-winner Danny Garcia (March 2017) before injuries sidelined him for nearly two years. The layoff forced Thurman to vacate the WBC crown he won from Garcia, which Porter won by defeating Garcia. “Adrien Broner is very defensive and patient, and he’s sometimes a little overly patient, which he can’t afford to be against Pacquiao,” said Thurman. Styles make fights, and Thurman’s intrigued by the 5-foot-7 Porter’s ferocity against the 5-foot-9 Ugas’ range and craftiness. “I think Ugas’ power is respectable, and with his height and reach, I wonder if he has the frame to beat Shawn. Ugas’ right hand is his strongest punch, whether to the body or a straight or and an overhand. But I think he respects movement and won’t try to steamroll you,” said Thurman of Ugas, a Cuban Olympic bronze medalist. Spence has both height (5-foot-10-to-5-foot-6) and reach (72 inches to 68) advantages over Garcia, who is making his 147-pound debut. For Thurman, that translates into a major obstacle for Garcia to overcome. “Errol Spence is a lot bigger than Mikey Garcia, and as the smaller guy who never has fought a world class welterweight the size of Spence, I don’t know where Mikey’s confidence comes from. But Mikey wants to prove to the world that he sees something which allows him to coordinate his hands and feet to out-perform a world-class welterweight named Errol Spence Jr.,” said Thurman.